Urban farming is defined as building development for the production of plants for the needs of the local community. The presented issues concern the shaping of urban farms for the preservation of the environmental balance of urban spaces and connections concerning the coexistence of architecture and greenery in the city. This chapter indicates the possibility of shaping synergistic spatial systems by integrating urban space and buildings with an innovative production function—a municipal farm—that complements the functional structure of the city in connection with the shaping of public spaces and the greenery system. The pro-environmental architecture connected with technologies enabling the production of plants in buildings enables the integration of urban space, complementing the functional and spatial structure of the city. The implementation of new technologies enables the production of plants in hydroponic and aeroponic farm buildings. The urban farm is an element in planning the city's sustainable development. Urban agriculture may be defined as building development created to host the production of plants for the needs of the local community. The presented issues concern the shaping of urban farms in order to preserve urban spaces environmental balance and to preserve connections concerning the coexistence of architecture and greenery in the city. As indicated, there exists the possibility to shape synergistic spatial systems by means of integrating urban space and building development with an innovative production function- an urban farm, which complements the functional structure of the city in connection to the shaping of public spaces, as well as the greenery system. The pro-environmental architecture connected with technologies enabling the production of plants in buildings makes integration of urban space possible, thereby complementing the functional and spatial structure of the city. The implementation of new technologies facilitates the introduction of plant production in hydroponic and aeroponic farm buildings. The production technology, as well as the program and structure of the urban farm development provide the subject for research and analysis in order to shape building development integrated with greenery. As pointed out, it is necessary to increase the scope of production of tangible goods and intangible assets, which takes place in the urban farm complex. The connection with public spaces and the implementation of building development with a public utility function is justified by shaping the land development program and development for the needs of the local community. The urban farm is an element in planning the city's sustainable development. 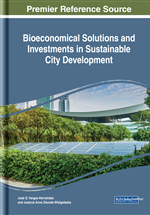 Research indicates that there exists the need to implement plant production and new technologies in the developing city and urban areas. The development of innovative technologies for plant production, energy acquisition and optimization of water consumption makes it possible to create urban farms within the city structure by means of integrating greenery with buildings. Eco-production arranged in multifunctional buildings is an architectural and urban planning issue from the scope of city development and revitalization of degraded areas. The urban farm is analysed in the context of the conversion of ways for supplying the local community with useable vegetation and food, as well as in the context of a special architectural task. The implementation of urban farms combines two trends towards shaping the city growth and city building development. The first trend may be referred to as a “smart city” that uses modern technology in the city structure. The second trend comprises pro-environmental solutions and “green architecture”. The introduced solutions enable optimization and balancing of energy consumption, minimization of environmental interference and integration of greenery with both buildings and urban space. The construction of urban farms while planning the city growth should be connected with the systems of road transport, public spaces and urban greenery. While planning a balanced development of a city, the construction of urban farms in the social, production, architectural, economic and environmental context should also be taken into account. The issue of city sustainable development is both multithreaded and interdisciplinary. The issue provides the subject for research, analysis and studies that constitute guidelines for designing and balancing areas, functional structures, building development and infrastructure in the city. The study presents research work results concerning the contemporary ways for shaping of the city, the development and transformations determinants, as well as urban farms in the city structure. The concept of ​​ contemporary cities sustainable development is implemented owing to new spatial models, technologies and social functions. The urban farm is implemented in a modern city for the sake of production function in order to fulfil the needs of the local community and for the sake of shaping the living environment parameters. The urban farm is an element of the city's sustainable development model, it integrates spatial and architectural solutions, provides green infrastructure and eco-production in the city. Sustainable Development: Inevitable and necessary changes and transformations for optimal and effective set of actions applied to improve the urban environment in connection with the development of social and economic structures, with the use of civilization achievements. Green City: Comprises pro-environmental solutions, optimization and balancing of energy consumption, minimization of environmental interference and integration of greenery with buildings and urban space. Smart City: Is a city in which the integration of human and technological capital takes place in order to improve the quality of life and to stimulate economic growth based on optimization in terms of natural resources management and participatory management. Eco City: Concepts of city that need to save water and energy resources and optimize its usage and management method is supposed to minimize the emission of carbon dioxide in production of energy from renewable sources. Urban Agriculture: Building development created to host the production of plants for the needs of the local community.